I have a strange relationship with plants. I adore them, but they seem to die in my presence. (Although I do have a Chia Pet that's doing quite well at the moment.) I've always wondered if there might be something about me that's toxic to plants. If so, I share that trait with the daffodil, which may be my favorite flower. They're springing up all over Brooklyn right now. (Brooklyn in the spring is unbelievably beautiful.) They seem so sweet and innocent--but each and every one of them is a potential serial killer. 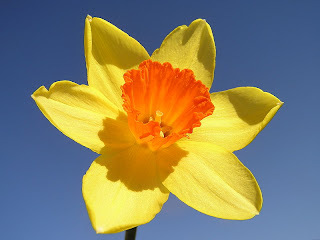 Put a daffodil (or any member of the Narcissus genus) into a vase with other flowers, and the daffodil will release a poisonous sap that will kill the other flowers. Pretty nasty, right? According to Wikipedia, "daffodil itch" is the bane of many florists. The toxic sap causes "dryness, fissures, scaling, and erythema in the hands, often accompanied by subungual hyperkeratosis (thickening of the skin beneath the nails)." I have no idea what some of that means, but ewww. The leaves and bulbs of daffodils contain a poison called lycorine, which can cause all sorts of foul symptoms. (I'd give you the list, but it's rather disgusting.) Yeah, but who would eat a daffodil, you ask? Well like any successful serial killer, it knows how to lure its victims. Because daffodil bulbs resemble onions, they have a tendency to end up in soups and stews. As you might suspect, schoolchildren are the daffodil's favorite prey. Great -- I (sometimes) sell daffodil bulbs where I work! They're not the only killer plants. Eucalyptus groves have little ground cover because the roots give off a poison for other plants. By the way, I second the Amy Stewart book suggestion. Good to know that the daffodil is the like the beta fish of flowers. It never occurred to me that's why they're always sold in bunches by themselves! large amounts of nutmeg is deadly too and can cause death. don't mistake it for cinnamon when doing the cinnamon challenge!